If you would like a review copy, contact me here. Drawing from a range of contemporary poetic traditions, The Purpose Pitch explores the overlap between narrative, pop culture, and the political. These poems are often funny, sometimes harrowing, and always unsettling. Through rants, narrative prose poems, absurdist dialogues, brutal police reports, invented biographies of real people, Google search results, and celebrity-interview mash-ups, Mockler shows us just how Boschian Western culture is in the twenty-first century. 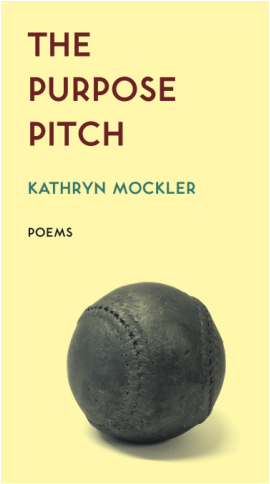 Kathryn Mockler’s chaotic third collection of poetry, The Purpose Pitch, irradiates the deep strangeness of our modern world. The collection embraces various forms, be it dialogue, found poetry, prose or script, which expose the characters and content from all angles. Mockler’s characters move through the collection with a subtly divine knowledge, like everyone (and everything) is “in on it” (the “it” being their whole entire futures). Mockler’s use of found text also works in tandem with her darker themes. “April 30-May 31, 2014” consists of eleven pages of police alerts relating to sexual assault. The sequence resembles the infamous fourth section of Roberto Bolaño’s 2666, but the inclusion of Canadian localities (as well as the very need to reiterate the prevalence of violence against women) enhances the repulsive power of Bolaño’s precedent. My poetry for the summer: Kathryn Mockler’s The Purpose Pitch and David McGimpsey’s Asbestos Heights, both of whom wow me with their sense of play. Zany, inventive poems, full of thrills. Enviable language, enviable approaches to what a poem can be and do. Really grown up stuff, but, like, with their pants down or something. Merciless as a grin full of razor blades, these poems rapidly cycle from hilarious to gutting, delighting in knocking the wind out of the reader. But even more than this, what defines The Purpose Pitch is how it revels in its cultural and linguistic vocabulary, drawn from pop and online culture, contemporary documents and search engine results. Her method of presentation may not be what we're used to, but Mockler doesn't shy from the meat. A long piece entitled "April 30 - May 31st, 2014" is a collection of headlines about women who were sexually assaulted world-wide during that short window. That the piece is eleven pages long is both exhausting and eye-opening, and affirms Mockler's solid if unorthodox place in Canadian poetry. Kathryn Mockler’s The Purpose Pitch (Mansfield, 96 pages, $17) combines True Detective levels of despondence with the wry humour of a Wilde. If Rust Cohle published poetry, it would go a little something like this: "How old were you when you realized the world was a nightmare from which you could never wake?" Presenting surreal, speculative worlds, the Toronto-based Mockler offers one brilliant, dark conceit after another. "I’m very good with death," proclaims one poem, while another counsels that "you will meet people in life with punchable faces Skyler is one of them." Mockler’s tone holds firm to its bleakness while cracking wise, having fun in the face of horror. Remember, kids: "the English teacher is not a credible source because she wants to kill herself." Belated thanks to the lovely, talented and scary-good @themockler for her hilarious The Purpose Pitch @MansfieldPress Read it! When reading Kathryn Mockler's "The Purpose Pitch" in your local cafe, it is important to wear something sparkly.